Stoking the Fire 2017 – Early Bird pricing ends on March 31st. Are you spiritually aflame, or a banked coal ready to be stirred into life? Join Friends as we stoke our spiritual fires and stretch ourselves through communal worship, learning, and fellowship. Together we will open ourselves to Christ’s presence and power and allow the Spirit to work within us. Stoking the Fire is FUM’s program for spiritual revival among North American Friends. This year’s theme is “Claiming Spiritual Power for Transformative Action”. The plenary leader will be Jan Wood, of Northwest Yearly Meeting. The dates are July 9–12, 2017, in Wichita, KS (immediately preceding the FUM Triennial). Mark your calendars! Representative Meeting will take place in Toronto at Friends House from June 28-30. Correspondence has already been sent to all Committee Clerks and Monthly Meeting Clerks with respect to submitting Committee Reports, State of Society Reports, MM statistics and agenda items. All reports must be submitted by April 30 to cym-office@quaker.ca. If you would like a copy of the correspondence, please let us know. The Draft Agenda and Reports will be available on the Business side of this site once they are received under Documents/RM Docs. We are happy to announce the Winter 2017 edition of The Canadian Friend. In this latest magazine you’ll find reflections on vocal ministry, and news, creative writing and reflections from Quakers across Canada. 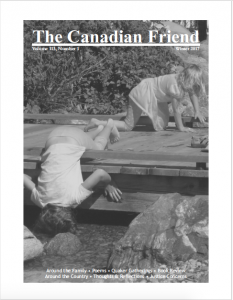 Click here to read the online version of The Canadian Friend (pdf). Printed copies are currently being mailed and will be arriving soon. Publications and Communications Committee is delighted to announce that Reykia Fick has accepted the contract to edit Quaker.ca and The Canadian Friend. Reykia brings extensive experience writing and editing for digital and print media, including in her current role with Greenpeace Canada and for Fairtrade International. She has also served Quaker communities in a variety of roles, including with Canadian Friends Service Committee. She lives in Ottawa and is a member of Ottawa Monthly Meeting. We look forward to working with Reykia to develop our electronic and print publications in their continuing evolution. Look out for upcoming announcements as we finalize a schedule for The Canadian Friend and updated guidelines for the website. In the meantime, if you have comments or questions about the website or The Canadian Friend, please contact editor@quaker.ca. Contact information updated June 11, 2017.